Following on from trying to program the LinkIt ONE on Mac, and Windows, I went looking for further information, I managed to find some information on the IDE GitHub page, I will compare how easy it is to program each of them with Blink.ino. 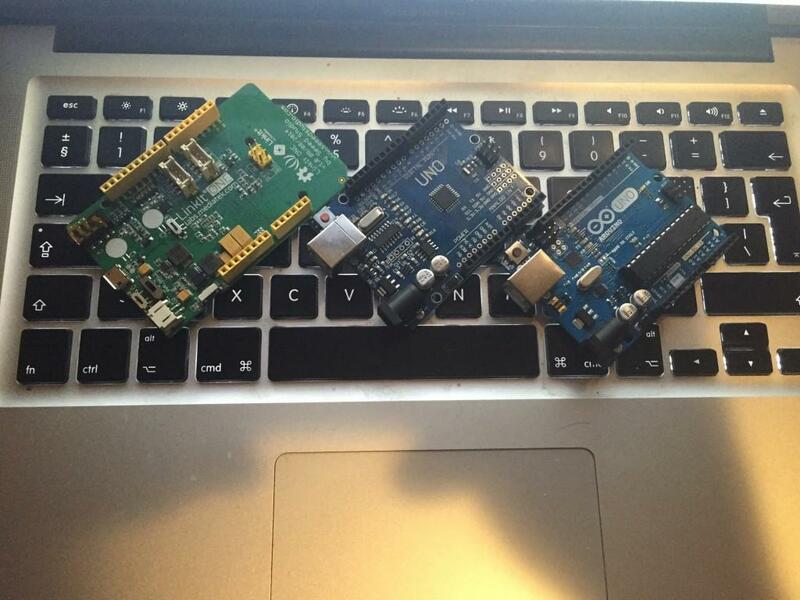 My mac is set up as per this page for the Linkit One, and this page for the Chinese ‘Duino. Attach Arduino to laptop using USB cable. Attach LinkIt ONE to Laptop using a USB cable, a 10 MB disk will be appeared. Make sure Verbose mode is on, so we can find the vxp file (like hex file for Arduino Uno) we are about to create, we need enable compilation verbose output in Arduino IDE (file > preferences). Use Arduino IDE for LinkIt One to build a vxp file (Verify). Find the location of the vxp in the verbose output (mine is in “/var/folders/h5/y10cm6g56t7gj0ghhnds878m0000gn/T/build8330802164272912049.tmp”). Copy the vxp file into the disk’s MRE directory and change the content of autostart.txt to match the path of the vxp file. safely eject the disk (make sure to do this, otherwise you risk corrpting everything and will need to re-install the firmware to recover the board). Change Switch one back to UART mode, and the new vxp file may be started. I have done the previous with Arduinos, Arduino Clones, Teensys, and Diavalinos. The only one I have ever had problems with which have lasted more than one glass of wine is the LinkIt ONE. Looking at the specification and feature set of the LinkIT boards they should be amazing, however the amount of problems I am having getting it to work I don’t think it is a product that I would recommend to some one less technical than I.